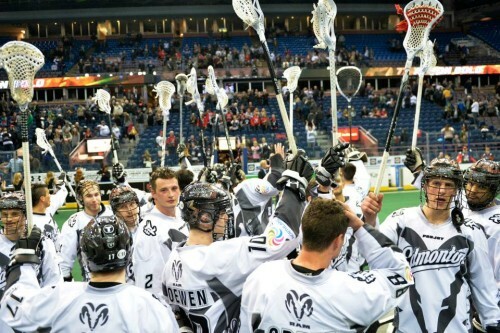 The Edmonton Rush played a textbook road game in Minnesota in front of 8,013 at the Xcel Energy Center as they continue to fine tune for the playoffs with a 16-12 win over the Swarm. The Rush started back up goalie Tyler Carlson in place of the resting Aaron Bold. Carlson made 30 saves en route to his first win of the season as a starter for Edmonton. The rest of the roster stayed pretty much the same with the offence rolling right along scoring at will. Zach Greer ended the game with four goals and an assist and was chosen the games second star. The game started with Edmonton taking the lead at 3:41 mark of the first quarter on a power play that had Jordan MacIntosh off for holding. The Rush struck again less than a minute later as Zack Greer scored on an assist from Ben MacIntosh. For the remainder of the first and second quarters the teams battled hard and played even as the Rush led by one, 8-7 at the half. Minnesota made a push for a comeback in the fourth quarter out scoring Edmonton 5-2 but it was too little too late as the Rush held on for the win. Edmonton closes off the regular season with a mathematical chance to finish first overall in the NLL next week when they face the Colorado Mammoth at the Pepsi Center in Denver. With a win and a combination of a Rock loss and a Rochester win, the Rush will carry home field advantage all the way to the Champions Cup.